Rebecca and I have been meaning to make our tutu's for a while. One weekend we decided to quickly sew them together. It was actually a lot easier than I expected! Definitely a try it yourself thing! 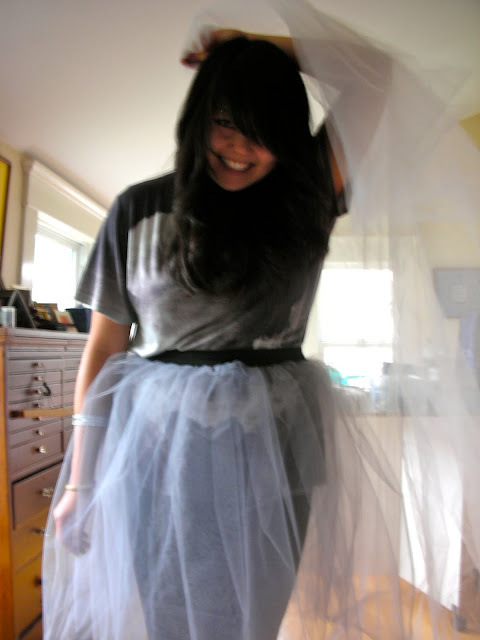 First, we bought about 5 metres of tulle, and a thick piece of elastic for the waistband. Sew the waistband together to fit, and then scrunch up the tulle as it passes through the sewing machine. To keep the waistband stretchy, keep the elastic stretched out as you sew on the tulle. It helps to have a second person on hand to help keep the fabric even. The tulle is quite transparent, so you definitely need to make a few rounds of sewing. We plan to shorten the tutu's and use them for an upcoming post! Keep an eye out! Cute! You need to get them under a dress!